Babies and Puppies and Barks! Oh My! While I know this was a massive waste of my imagination, the worry of how to handle two dogs and a baby was legitimate. Sheeba can be dominant, and she expresses this with her bark. I didn’t want her to scare the baby, and so I immediately started searching for bark control products for the household. Both of my dogs bark, and there are days where the slightest movement outside can throw them into a tizzy. 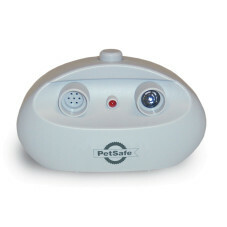 For days like that I brought home the PetSafe Indoor Ultrasonic Bark Control unit, which emits a high-frequency ultrasonic sound that deters them from continuing the craziness. 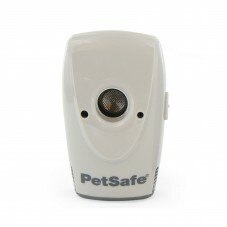 I love this product because they both hear it and understand what is happening. They know that the constant barking serves no purpose when it is all just over a falling leaf. Ok, so they probably don’t know this, but I’d like to think that deep down we have the same understanding. Then there are the days that Sheeba is the only culprit of chaos. 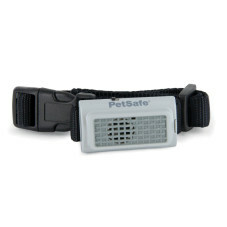 In order to train her without confusing Tyson, we use the PetSafe Ultrasonic Bark Control Collar. While some dogs respond better to our static correction or spray collars, Sheeba tends to respond best to the ultrasonic line of products. I think it is due to her vocal dominance. By interrupting her main form of bossing us around she is suddenly a polite little dog. I brought both of these products home a few months before the baby made his entrance into the world. Many parents have a nesting period of getting the nursery in order, making sure clothes are folded and buying the perfect baby blankets. My nesting started with training my dogs to get ready for an infant (or a member of the pack as they now view him). Sheeba and Tyson responded well to the training, and the big moment came where the dogs could show off their new behavioral excellence. Dylan came in quietly in a car seat nestled under his hospital blanket. Suddenly the dogs were alert and curious. Sheeba licked his toes while Tyson sniffed the blanket. A door closed downstairs, which is typically the end of any quiet peace in our house, but the dogs were silent. No barking. No madness. The house was calm and my training had paid off with the help of these incredible products. Little did I know that barking would be the least of the noises yet to come in our household, but at least there was one less disturbance to aid in the no waking the baby 2013 campaign. next to the baby's carrier.